Distance - 33 km round trip. Terrain - Flat, easy, crushed limestone path. Separated cycle path for most of the way, except Oak Avenue (Ormond Rd) and Omahu Rd (shortcut only). Highlights - Lunch in the sunshine at one of the wineries. 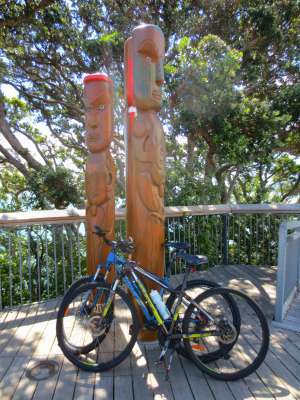 Map and website - Download the Hawke's Bay Trails Map here. 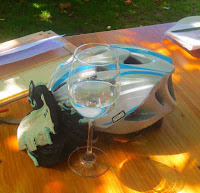 Cycling in Hawke's Bay: From the National Aquarium of New Zealand to Bay View. If New Zealand has a leisure cycling nirvana, Hawke's Bay is it. In a region with a warm, sunny, Mediterranean climate, lovely scenery and lots of things to do on those essential rest days, there are over 200 km of easy year-round cycling trails. 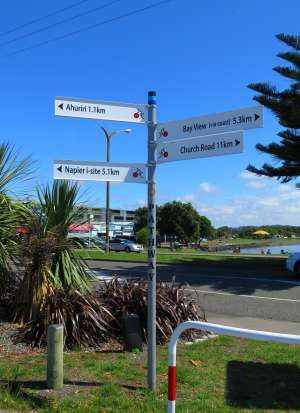 Hawke's Bay encompassing the towns of Napier, Hastings and Havelock North in the North Island, is the perfect destination if you have never cycled on a holiday before and want to give it a go. 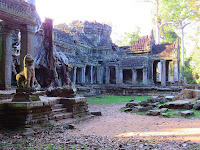 None of the trails take more than a few hours and you will never be far from civilisation. Download a copy of the Hawke's Bay Trails Brochure from hawkesbaynz.com or nzcycletrail.com, or pick up a copy from an i-SITE & Visitor Information Centre, grab a bike and go! Have I told you I love street art? Ever since David and I stumbled across the Open Air Museum in Valparaiso, Chile, I have been a street art addict, tracking it down wherever we go. Napier, it turns out, is a street art addict's idea of heaven. In March 2016, Napier hosted the Sea Walls: Murals for Oceans public art project in New Zealand. 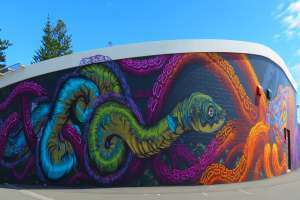 In collaboration with the PangeaSeed Foundation, Napier City Council brought 30 national and international artists to the city to transform 29 blank walls into stunning works of art. In keeping with PangeaSeed's mission to educate and inform on oceanic environmental issues, the murals draw on the theme of threats to the health of the world's oceans. In February 2017, when we visited Napier, the murals looked as fresh and bright as though they were painted yesterday. 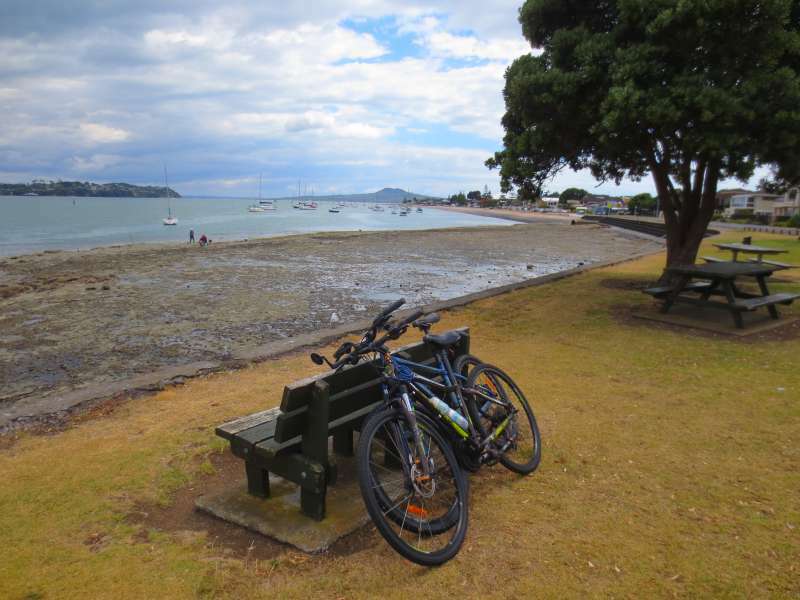 Cycling in Auckland: Was it worth all the hassle? If you read my post a few weeks ago titled A Cyclist's Lament: Welcome to New Zealand you will know that our New Zealand trip got off to a rocky start. Why was I not surprised? The last time we flew our bikes to the Land of the Long White Cloud we struggled to get them through quarantine. You can read the saga here - Life in the Slow Lane: Welcome to New Zealand. The time before that, our troubles began at Sydney airport. You can read that story at - Queenstown and the Flying Bicycles - or why you should never fly with a bike! 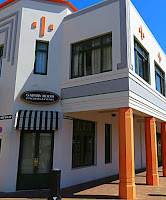 From Disaster to Art Deco in Napier, New Zealand: How an earthquake shaped the city. At 10.47 in the morning on 3 February 1931 disaster struck the city of Napier in Hawke's Bay, New Zealand. For two and a half minutes the ground convulsed; heaving upward, pausing for a moment, then slamming back to earth. Buildings swayed, collapsed and disintegrated. Gas mains burst, fires began and terrified residents ran out into the streets only to be killed by a deluge of brick and masonry. This was New Zealand's deadliest earthquake. When it was over, 256 people were dead and Napier was all but destroyed. When the city was rebuilt, Art Deco was all the fashion and the inhabitants set about making their home a showcase of architectural design. 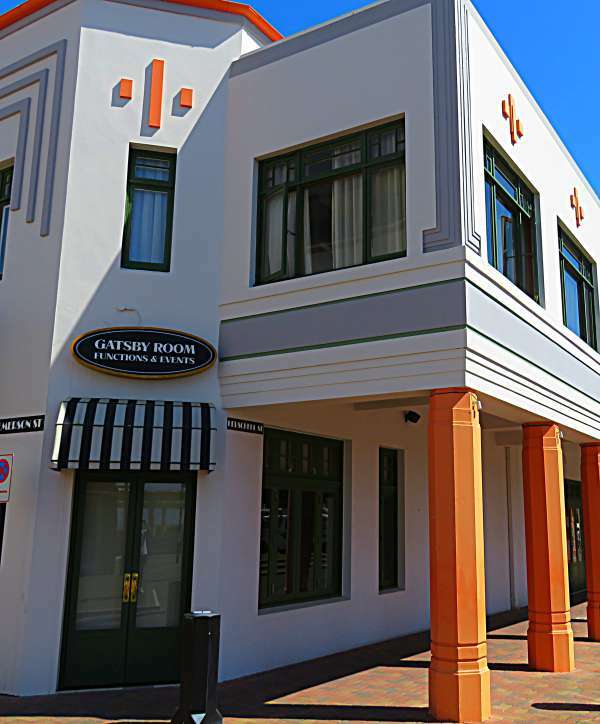 Today, Napier boasts one of the finest concentrations of Art Deco style anywhere in the world. You know an attraction is good when you do it again the first chance you get. Wai-O-Tapu was like that for us. We discovered this geothermal wonderland two years ago on a trip to New Zealand's North Island. 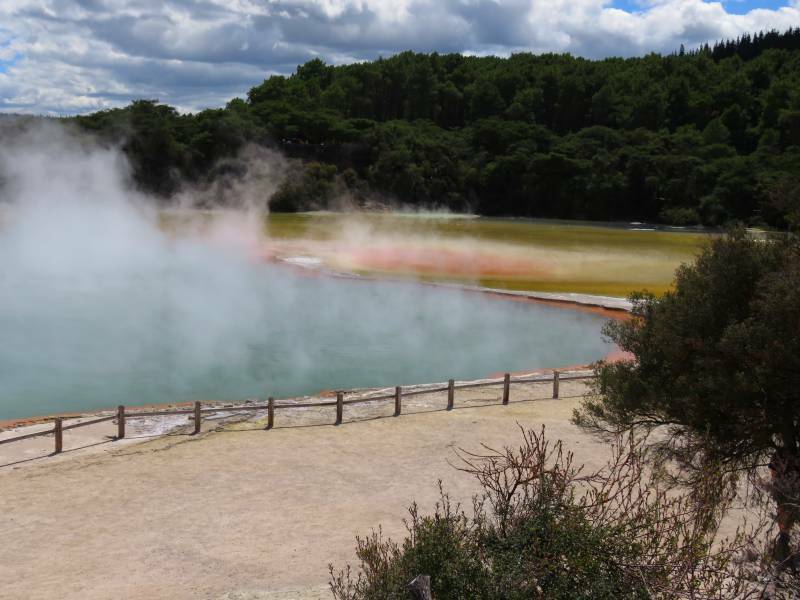 On our return this year, Wai-O-Tapu was top of our list of things to see. Wai-O-Tapu (meaning 'sacred waters' in Maori) is a stunning geothermal attraction with a well-deserved reputation for being the most colourful and diverse in New Zealand. 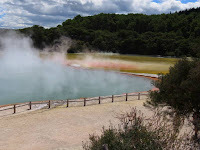 Wai-O-Tapu is part of one of the most extensive geothermal systems in New Zealand; literally covered with steam vents, boiling pools of mud, multi-coloured mineral laden pools and collapsed craters. 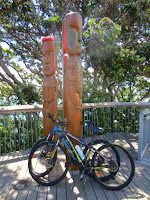 A Cyclist's Lament: Welcome to New Zealand! Sometimes David and I make things difficult for ourselves. When it comes to great countries to ride a bicycle in, New Zealand is right up there close to the top of the list. The whole country is criss-crossed by rail trails and cycle paths. We have come here to cycle. We are going to start out in Auckland, head north for a few days and then spend a week near Napier in Hawkes Bay. Auckland is a city of 1.5 million people. You would think it would be a simple thing to organise bike hire for a two week trip in a city that size. Not for us, the easy option. David doesn’t hire bikes. He dislikes the way they are never as comfortable as his own bike and he hates the extortionate cost - often more than renting a car. He much prefers to subject himself, and me, to the enormous hassle and precision planning required to fly our bikes with us across the Tasman Sea from Australia. 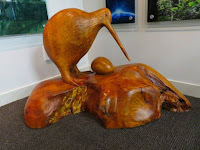 For a country which produced the All Blacks, some of the toughest footballers in the world, it seems incongruous that New Zealand's national symbol, albeit an unofficial one, is a 45 cm (17 inch) high, flightless bird which registers about 15 out of 10 on the timidity scale - but there you have it, some things in the world just can't be explained. David and I are in Northland, the northern tip of the North Island of New Zealand and today we went searching for kiwi. We didn't go looking in the wild - kiwi are nocturnal, shy and very hard to find - but we did the next best thing, calling in at Kiwi North. Kiwi North has a purpose built Kiwi House where Puna and Kapua, the two resident kiwi, live. Their environment is as close to nature as possible with a carpet of leaf litter allowing them to forage for insects and other food the same way they would in the wild. It even rains - twice a week. Special lighting turns day into night so visitors can see them at their most active. Life in the slow lane: Welcome to New Zealand! We are standing in the slow queue at Auckland airport. We inch forward and stop. Kiwis are lovely people but can't they count? Six customs officers are checking quarantine declaration forms. There are four for the line to our left and two for us! "You want to see what!" David lifts his eyes from the newspaper and peers at me across the breakfast table. "Mud," I am trying to sound convincing here. Riding the rapids with Tongariro River Rafting: Taupo, New Zealand. We are staying at Lake Taupo, in the North Island of New Zealand. Cue Plan B - Kelly Tarlton's Sea Life Aquarium in Auckland has King penguins - lots of them. New Zealand has some great rail trails. Cycling them is the main reason we are drawn back here again and again. It is also the onlyreason we tolerate the hassle and aggravation of flying our bicycles across the Tasman Sea from Sydney. (For my blog post on our first experience flying bikes to New Zealand click - here). Queenstown, New Zealand is adrenaline junkie heaven. Parachuting, bungy-jumping, jet-boating, mountain-biking, ballooning, heli-skiing, canyoning, rafting and dozens of other fast-paced thrills are on offer year-round. Fit, athletic, twenty-somethings are drawn here, like fans to a rock concert, from all over the world. The Otago Rail Trail and A Universal Truth. It is a truth universally acknowledged that a rail trail should be cycled in one direction - or the other - only the truly psychotic cycle both. Would you ignore this sign? One of my greatest failings as a world traveller is a serious and persistent law-abiding streak. Penguins, dolphins and a petrified forest. Queenstown and the flying bicycles. Turning up to an airline check-in counter with a couple of bicycles is one of those experiences which seemed like a good idea when we planned it, but really fell apart in the execution - what a hassle!